Easter is fast losing its relevance. People are increasing embracing the festive aspect of the festival and Good Friday and Easter Monday have become a welcome extension to the weekend and a chance to go on the first spring vacation. Over the years, the festival has taken the shape of a wonderful occasion to hang around with the long lost friends, close relatives and family members, and to have a lot of fun together. Well, here are some practices that you can add to your celebration and keep it both religious and fun. In Eastern Europe, church bells are rung throughout the day, all day, to remind the entire population that it is the ultimate feast of joy, the Resurrection. Blessed food is eaten with the extended family and friends. Here in Albuquerque, I let the children come and clang away on the old church bell. They take all that left-over energy and tire themselves out harmlessly and happily. A popular Easter game is to have cracking contests with the decorated and blessed eggs; the one whose egg lasts longest without damage will have the best year. Bulgarians add the practice of cracking an egg against the wall of the church, and this is the first egg to be eaten at the Easter meal. In Bulgaria, a loaf of paschal bread and red eggs (in honor of the Precious Blood) are given to Muslim neighbors, who reply with a gift. Poland has Dyngus Day on Easter Monday (this is still widely observed in my hometown of Buffalo,NY): On this day boys roam around the neighborhood to sprinkle girls with water or perfume. This custom of watering has its roots in pagan traditions since the pouring of water is an ancient spring symbol of cleansing and purification. Easter Monday has also been celebrated as “Switching Day” because on this day boys switch girls with a small willow branch with the hope of having children when those girls are married women. The Byzantine Catholic practice of dousing is a little different. Here, the men douse women on Easter Monday, in imitation of the Apostles having poured water on St Mary Magdalene when she announced the resurrection, and they disbelieved her. On Easter Tuesday, roles are reversed, when Mary and the other women poured water on the shamefaced Apostles who had seen the empty tomb, and only then believed. Let me tell you, in the Greek Catholic regions of Slovakia, and in Transcarpathia and Galicia in westernUkraine, students go all out with this custom, and few people are safe on the streets! People make a point of wearing a jacket, no matter the weather, because they know they are going to get doused – or even soaked! The Oster Hase, or Easter Bunny, is a German tradition, rooted inAlsace, the land that my ancestor Michael Zugger left to go to Buffalo, New York, in the 1830s. The rabbit was considered to be a sign of new life in spring and abundance of life, due to their large families born around the time of the vernal equinox, which is always close to Easter. 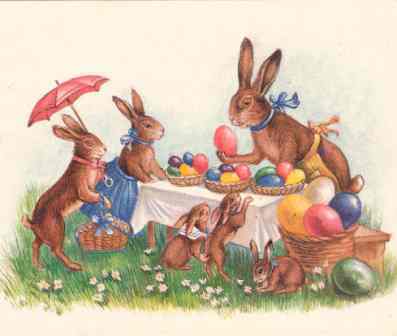 Children build decorated nests in a corner of the house, complete with grass and flowers, and the bunny drops decorated eggs and sugar candies on Holy Saturday night, but only in those nests made by good children. The nests evolved into our modern Easter Baskets filled with candy and chocolates that have not been eaten since Lent began. In Germany there are several different customs, in addition to the well-loved rabbit. These include the practice of decorating eggs, and also of hanging hollow painted eggs on a miniature tree. This Easter Tree holds both eggs and ribbons and serves as a centerpiece for the table. But in Eastern Europe, the baskets are much more elaborate! While the Latin rite Slavs bless food on Holy Saturday afternoon, the Byzantine rite populations (both Catholic and Orthodox) bring baskets of food to church on Easter Sunday. These are big baskets, containing ham, sausage, butter, eggs, Pascha loaves made with a dozen eggs each, cheese, chocolates, and any other food given up during Lent. Everything is cooked in advance, and is eaten cold on Easter Sunday. No cooking that day – everybody gets a rest! Also the rabbit was seen as the first witness to the power of Jesus’ Resurrection. When the rabbits witnessed it, they trembled in awe, and that is why they still tremble today! Easter Week is also the time to visit the graves of loved ones. Blessed bread is left at the grave as a sign of belief in the Resurrection. In some places, people sit down and eat Easter food at the graves, again to celebrate the coming resurrection of the dead. It is a comfortable way to introduce children to cemeteries and the practice of praying for the souls of the departed. Traditional Basket Cover: Christ is risen! Indeed He is risen! The Easter Lily is the common symbol of the holy day. Tradition says that the first ones bloomed in the Garden ofGethsemane, where the drops of Jesus’ bloody sweat fell. Thus, from the blood comes hope in the resurrection. Another tale is that when Eve was expelled from Paradise, she wept, and her tears brought out the lilies. Our story of the Dormition of Our Lady (August 15) says that when the empty tomb was opened to view her body, the dominant flower was the Lily, since it is an ancient symbol of purity. Finally, every daily Liturgy of our Bzyantine Catholic Church is a smaller repeat of Easter. The “Christ is Risen” is sung at special moments in the Liturgy, and the splendid hymn “The Angel” replaces the regular Irmos(It is truly proper). Keep up the season by greeting one another with “Christ is risen! Indeed He is risen!” You can’t beat that practice for keeping Easter a religious holiday … if all the Eastern Catholics would introduce their friends to this simple practice, the power of the Resurrection would be communicated so easily to so many. But whatever you are doing for Easter, may it be in honor of the Risen Lord, and may you, the dear reader, be lifted up by His life-giving sacrifice on the Cross and awesome Resurrection into new life on Easter and every day.